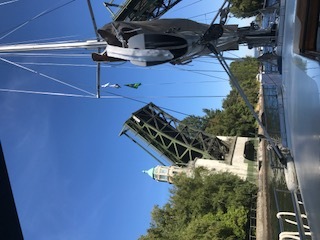 Our next step is Seattle and going up to Lake Washington through the Ballard Locks and a unaccountable number of drawbridges. Dawnbreaker deserves some sweet water running through her veins as we need a swim in the lake. 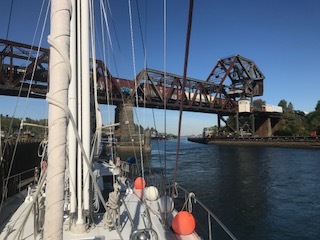 The lock trip is gorgeous and exciting, and a time lapse video is available on Facebook. 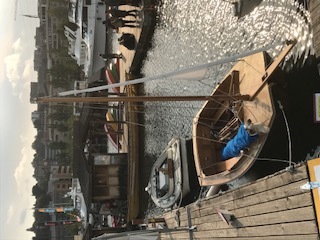 We toured in Lake Union, in the heart of the city and trolled along the houseboats. 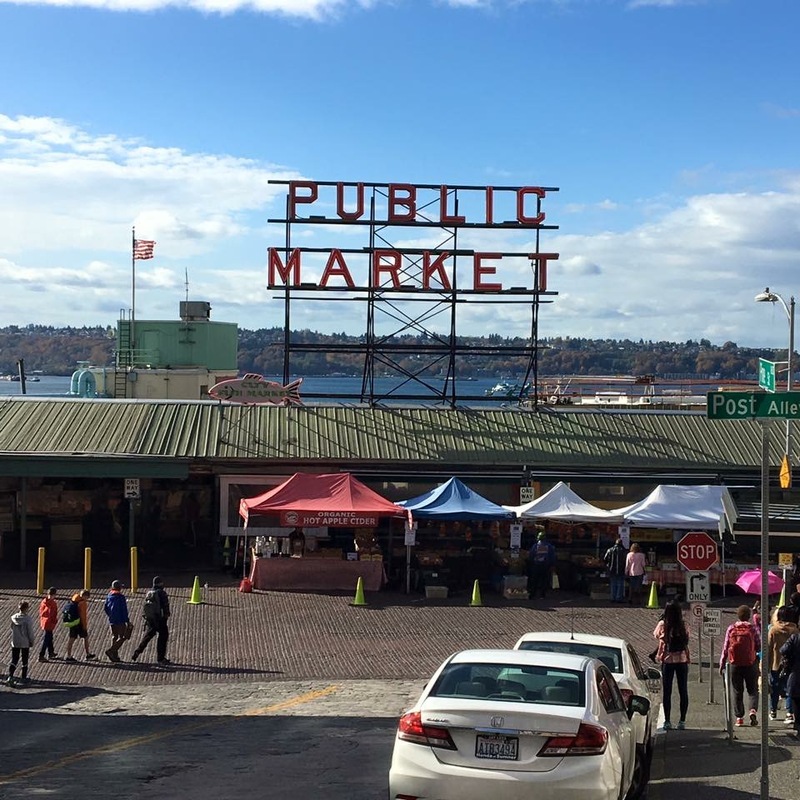 One of them was the set of the “Sleepless in Seattle”movie with Tom Hanks and Meg Ryan. Due to a football game of the Huskies we had to rush through the drawbridges before game time as the traffic is stopped on the causeway. We made it to this enormous lake in time with the intention to sail south. Our wished were hindered by the clearance of the new I90 floating bridge. Only 60’ while we need at least 80’. 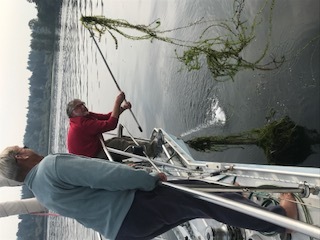 Anchoring at the lake is a challenge as several county or municipality hinders you from anchoring in most of the shore to avoid upsetting these upscale homeowners from having boats obstructing their view. There are only two spots one can anchor. 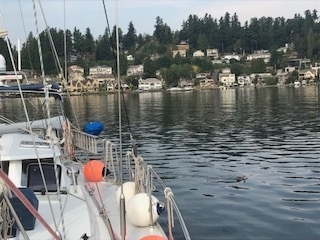 We chose Juanita Bay for the first night. 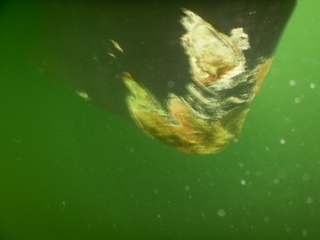 With water temperature at 22°C Thomas decides to go for a swim and a dive to inspect the damage to the keel from our rock encounter early in June. Paint and putty were gone in several spots, but overall all seems well and structurally unaffected. Washington state has an interesting waterfront law. You not only own the land and access to the shore but also the ground up to 50m beyond the hightide mark. In other words you can not drop and anchor on the grounds closer than 50m from shore. 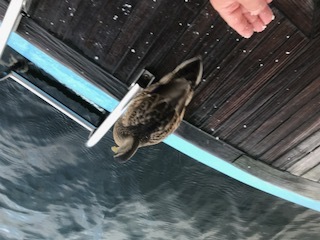 You can float but not touch ground. Weird!!!! 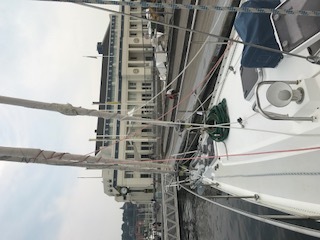 Having pumped sweet water to the system we decide to go sailing up north the lake on a very light breeze only interrupted by the noise speedboat racing. 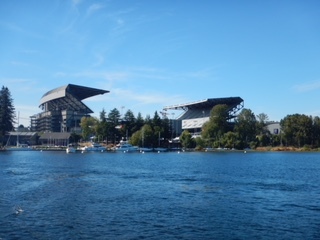 Another football game - now the Seahawks against San Francisco 49rs put a schedule restriction to return to Seattle Union Lake, so we leave in time to avoid the causeway closing. Back to Union Lake we were fortunate to find a mooring at Union Lake Park close to the Maritime and Industry Museum. A prime location and cheap. Gary joins us for happy hour with 4 bottles of fine Washington and Oregon and a lecture about local wine production. 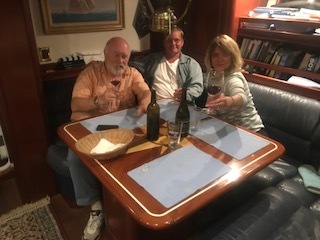 After 3 bottles we get excited about sailing up the Columbia River - Portland - and visit the vineyards. 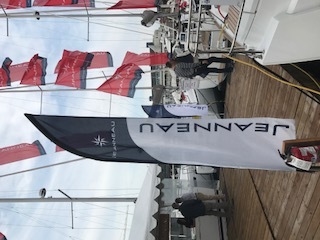 A 240Nm detour on our sail to San Francisco later this month. Let’s see how the weather favors these plans. 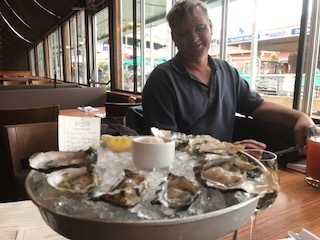 Next day tourist program and we take a cab to Seattle’s waterfront where we have lunch with a view to Elliotts Bay (at Pier 56) Of course Thomas had to have his Oyster sampling with a nice Oregon white vine. 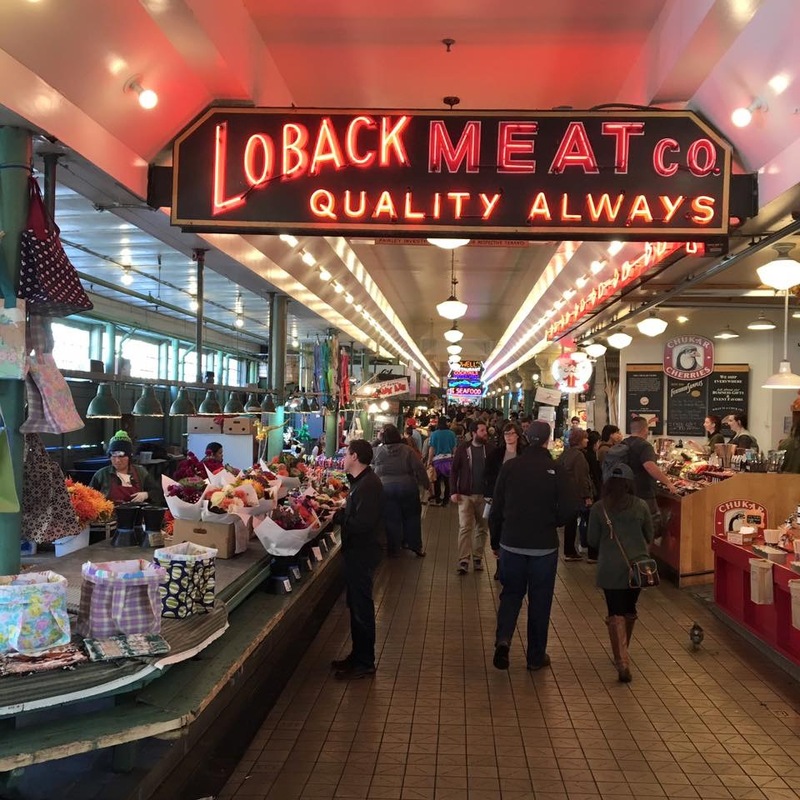 After lunch off to Seattle famous Public Market. One of the city’s landmark and busy with tourist. It is also the site of the first Starbucks Café. Next day we leave Seattle not after receiving Dal’s new Musto boots. He will join us on the trip to. San Francisco departing from Victoria on the 28th. 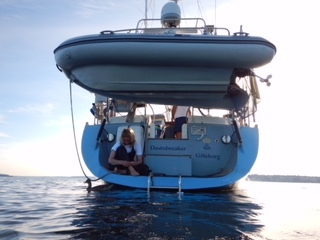 We need to be at SFO on the 11 of October as our rookie returns home after 45 days of her first sailing experience.